Qatar’s Hamad Ali M A Al Attiayah claimed the individual equestrian jumping title here today as action in the sport at the 2017 Asian Indoor and Martial Arts Games came to an end. The 22-year-old, who helped Qatar win silver in the team event on Thursday (September 21), triumphed by just over a second from Saudi Arabia’s Khaled Abdulrahman S Almobty in a seven-man jump-off. Iran’s Davood Pourrezaei rounded out the podium on a day when the last two rounds were held to decide the medallists. Al Attiayah, riding 10-year-old gelding Clinton, completed the course in the jump-off in 38.81sec. Almobty had to go the long way round to the final fence and fell just short, finishing in 39.91. "I knew I had to be fast and sharp to win the gold," said Al Attiayah, who competed at the Rio 2016 Olympic Games, but did not get past the qualifying rounds. "I was a bit fast, but not so fast, but I was lucky that when Khaled landed for the final fence he missed the turn between the tree. "That’s what made me get the gold medal. "I am thanking God for making me lucky. "Rio was a good experience for me - I learned a lot." Pourrezaei was the first rider to compete in the jump-off and set the benchmark time of 41.86, which ultimately was enough for the bronze medal. 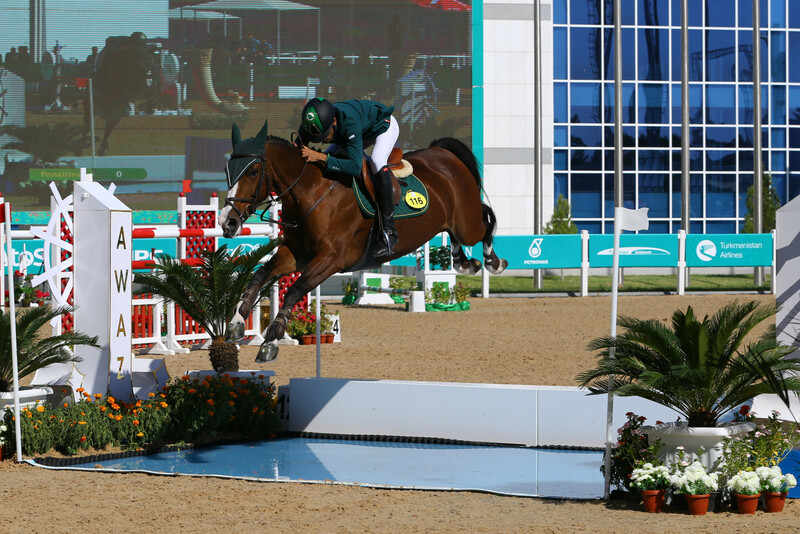 Abdullah Waleed Al Sharbatly, who like fellow Saudi Arabian Almobty went into the final day with a faultless record, ended up in fifth place after knocking down the first fence. The London 2012 Olympic team bronze medallist finished behind Kyrgyzstan’s Kamil Sabitov, who was the only other rider of the seven that progressed to the jump-off to post a clear round. Both Almobty and Al Sharbatly had been chasing double gold having contributed to Saudi Arabia's gold medal-winning performance in the team event. But they were no match for Al Attiayah, who earned Qatar their third gold medal of the Games. Saudi Arabia finished top of the overall equestrian medal standings with one gold and two silvers. Qatar came second with one gold and one silver, while Turkmenistan ended up third with one gold. Iran, Kyrgyzstan and Syria all secured one bronze each.